The Blackhawk Belt Pouch Holster hides a revolver or pistol in plain sight, keeping it protected and concealed during transport. Without an obviously tactical design, it looks like an ordinary tourist waistpack. The Mini fits sub-compact automatic pistols and five-shot revolvers, while the large fits full-size automatics with barrels up to four inches long. It is made from durable 1000 denier Cordura nylon that resists wear and water intrusion, and features a convenient top zipper opening that can be left open without revealing the weapon. The firearm sits behind a hook-and-loop flap, hiding it from prying eyes while allowing rapid access. The bag also includes a front pocket for small items like keys or coins. 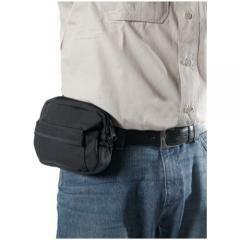 Its sturdy dual belt loops fit a belt up to 2.25 inches wide. Exactly as described-wearing it the next 4 days on a short trip. Retired Sergeant suburbs of Chicago. Pouch holster works well with summer clothes (Shorts and tee shirts). Just what I expected from Blackhawk. Fits my Kimber perfect and holds 2 spare mags plus my phone and money clip. I use it every day. Works very nice easy access also good for the phone carries an extra clip. Great holder and like fact that you can carry other small items in it and fits great on the belt. This pouch has a area for your gun, plus three other areas to place items. I love this pouch. What size Blackhawk Belt Pouch do I need to carry my Glock 42 380 Auto? Will this hold a Glock 19? Which size? Will a Glock 21 fit in the Blackhawk belt pouch holster. If yes, will it fit with a rail light on it. If no to both, do you know of a belt pouch holster that will fit a glock 21. The large size measures 8.75" W X 7" H X 1.625" D and fits full size autos up to 4-inch barrel. It will accommodate accessories on the rail. 5 Point Florida Star Badge - B2243 - 1 1/4" x 1 1/4"